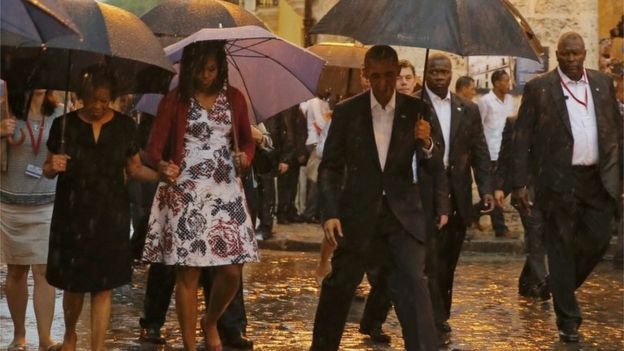 The Obamas later began a walkabout in historic Old Havana. 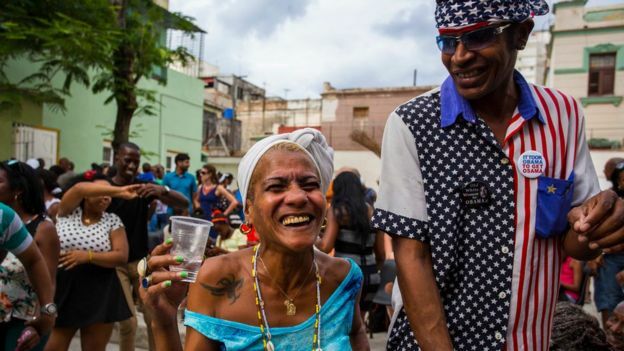 The tour was meant to see them interacting with ordinary Cubans on the streets, but this part of the itinerary was marred by a tropical storm. They huddled under umbrellas before visiting the national cathedral. President Obama’s visit is the high point of a recent easing of ties, which included the opening of embassies last year. Police took away dozens of demonstrators from the Ladies in White group, formed of political prisoners’ wives, from outside a church where they attempt to hold weekly protests. Cuba is one of the most exotic places I have visited. The mix of crumbling but beautiful Spanish colonial, 1950s Americana, and 1970s Soviet utilitarian, all laced with plentiful mojito cocktails and the sound of salsa is beguiling. It’s fabulous. I was here twice last year. The first time just after Presidents Obama and Castro announced their desire to open a new chapter in relations; the second when Secretary of State John Kerry flew in to re-open the US Embassy on the waterfront. Now I am back for a third visit – and the cocktail that is Havana has a new ingredient. Well, two new ingredients actually. One is the smell of fresh paint. The other is shiny black tarmac on road surfaces where the potholes have been filled in. Of course for security reasons, no one is saying precisely where the president will go when he’s here, but here’s my top tip as a highly trained investigative reporter. No. Don’t follow the money. Follow the smell of fresh paint. And roads where the potholes have been filled in. That’s where the president is going to be. Correspondents say the visit – the first by a sitting US president for 88 years – marks a huge turnaround in US-Cuban relations. Mr Obama and Raul Castro will sit together at a state dinner, there will be a joint news conference and they will discuss trade. The White House has made it clear President Obama will meet political dissidents, whether the Cuban authorities like it or not. That is expected to include members of the Ladies in White group. This visit does not mark a complete normalisation in relations, however. The 54-year-old US economic embargo of Cuba is still in place and can only be lifted by a vote in Congress. Meanwhile, Cuba still complains about the occupation of the US naval base at Guantanamo Bay. Nevertheless enormous strides have already been taken, our correspondent says. Mr Obama and Mr Castro agreed in December 2014 to end decades of frozen relations that began when Cuba’s revolution overthrew a pro-US government. Since 2014 there have been commercial deals on telecoms and a scheduled airline service, increased co-operation on law enforcement and environmental protection. On Wednesday Mr Obama sent a letter on the first direct mail flight from the US to Cuba since the revolution. And on Sunday, US hotel company Starwood become the first American firm to agree a deal with the Cuban authorities since 1959.